A lovely villa with a top host! First of all I would 100% recommend the Calodyne Villa. It is a lovely holiday home with an adorable back yard with a pool and sun lounges and a lot of space for relaxing. We had a lovely lady come and keep the house nice and tidy for us. We are extremely glad to have stayed at this Villa. What made our experience even better was definitely our wonderful host Philippe. We could not have asked for a better host. He was always ready to help us with everything and solve any problems we ever had. He is very quick to respond to phone calls and messages. He makes sure that everything is okay with the guests. He even welcomed us with a lovely meal on our day of arrival. On top of everything we were lucky enough to be in Mauritius for the mango and avocado season and Philippe would always suprise us with fresh fruit straight from his garden. Thank you so much for everything! Overall our stay in the Villa exceeded our expectations. 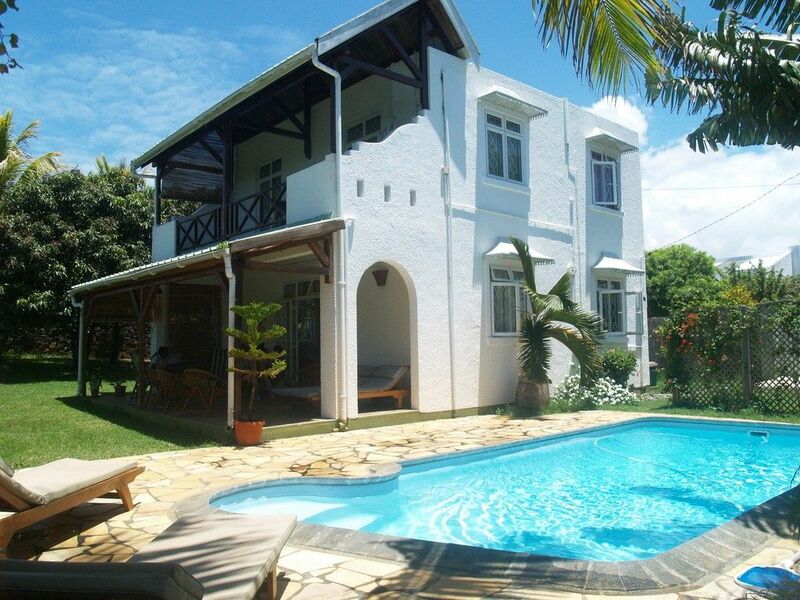 If you are looking for a relaxing stay in Mauritius you will definitely love Calodyne Villa. Charmante villa, endroit calme et paisible. Villa typique située dans un endroit calme, a un peu plus d'une centaine de mètre de la mer. Maison superbement bien entretenue par la sympathique Marie. Equipement complet et en bon état. Chambres et living spacieux, même si nous avons passé notre séjour principalement sous l agréable véranda. La sympathie et l accueil de Philippe Lesage était au dessus de nos espérances. Petit bouquet de fleurs à notre arrivée ainsi qu'un repas et des boissons fraiches. Toujours discret, aux petits soins pour la piscine et le jardin mais toujours là pour nous renseigner en cas de besoin. Aimait de nous faire également découvrir les spécialités locales en provenance directe de son jardin. Ce fut un séjour très agréable en plus d'une rencontre chaleureuse avec des personnes on ne peut plus sympathique. Nous recommandons vivement cette location. Nous espérons y retourner un jour. Everything you need for a self catering holiday is provided. Philippe, the owner, goes over and above what is necessary to make sure that you enjoy the time in his villa. He lives next door and cleans the pool every morning and waters the garden every evening so is always at hand if needed. Very, clean and comfortable. Well recommended. Magnifique location, idéalement située près de notre site de kitesurf à Anse la Raie. La maison apporte toute les commodités nécessaires, le confort est parfait pour 6 personnes, la piscine et le jardin sont très agréables. Le ménage est réalisé tous les jours et Philippe nous apporte les précieux conseils de visite de l'ile et d'excursion ou encore de restaurants. Wunderschöne 3 Wochen durften wir hier in Calodyne verbringen. Für Selbstversorger ist das Haus ideal. Die Küche ist sehr gut Küche. Ein Grill ist auf der Terasse. Der Supermarkt ist leicht zu erreichen. Ein Auto ist trotzdem gut, auch wenn regelmäßig Busse nahe am Haus halten. Es ist sehr ruhig und abseits der Hauptstrasse. Gelegentlich hört man am frühen Abend Musik vom Hotel in der Nähe, was uns aber nicht störte. Wir können das Haus sehr empfehlen, da es alles für einen schönen und privaten Aufenthalt bietet. Calodyne villa is situated on the northern tip of the island of Mauritius and is approximately three minutes walking distance from the sea. The Northern region is known as the 'Northern Plains' for it is generally as flat as Belgium. Its beauty and interest definitely being the seaside as the open sea off the coast is wonderful and is attractive all year round. If you wish to enjoy some night life then go to Grand-Baie which is only 10 km away. But Grand Baie is far from being a night only place. Packed with the finest shops and restaurants of Mauritius, it is the ideal landing place for the tourists wishing to carry a variety of activities like diving,undersea walks, day trips in catamarans around the isles of the North. The world famous Pamplemousses Botanical Gardens is also a short drive away. The garden is famous for its giant water lilies, spices, as well as 85 varieties of palms. Many trees have been planted by world leaders such as Mrs Indira Gandhi and Francois Mitterand.